Notes: 1. Articles in The Moving Picture World, May 12 and 26, 1917, gave the length of this film as seven reels. Two articles in The Moving Picture World, June 30, 1917, each give the length of the film as six reels. Advance notices gave the length as five reels. An article in Exhibitors Herald, May 26, 1917, gave the length as seven reels. It is believed that the film was expected to be seven reels but was released in five. 2. 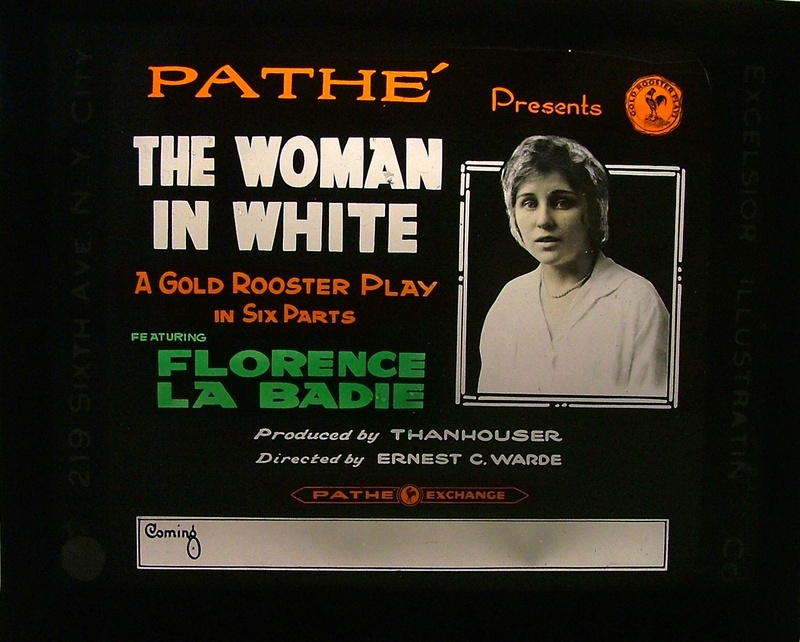 On October 20, 1912 Thanhouser released a two-reel film of the same title, The Woman in White, based on the same story. The background to the scenario is detailed under that entry. 3. The attribution of the reissue title, The Unfortunate Marriage, is tentative. It is believed that the film was re-released under this title in the 1920s, after the Thanhouser era. 4. Filming of this feature was finished during the first week of May 1917. "Adapted from Wilkie Collins' famous novel. This is a great story as all will remember. A young girl is forced into marriage with a villainous impostor who at once plots with the aid of a friend who is even worse than he, to get her out of the way in order to get her money. Almost successful the plot fails at the last moment, defeated by love. A picture of thrills, suspense and heart interest, beautifully produced by Thanhouser. Coming soon." "Edwin Thanhouser has assigned Richard R. Neill to play leads in a Florence LaBadie production [The Woman in White]. Mr. Neill brings to the Thanhouser studio fine experience, gained in a number of motion picture companies. He was last with Fox, supporting June Caprice, and played with Gail Kane, Mabel Taliaferro, Nat Goodwin, and others. His screen career has been with Equitable, Fox, Metro and World. Mr. Neill had a legitimate stage career of six years under the management of Charles Frohman and was also with E.H. Sothern. He was seen with Virginia Harned in The Other Girl, and with Mary Mannering, W.H. Thompson and others. His first appearance with Thanhouser will be in a new play by Lloyd Lonergan." "'The new LaBadie feature is a seven-reeler like The Vicar of Wakefield. But it is not that style of a play. I would call it a red-blooded melodrama. I cannot give more particulars until we have run through a first print, but I don't mind indicating here that the new seven-reeler is in the sensational class. Strictly clean, of course. In Miss LaBadie's support are Richard R. Neill, Wayne Arey, Gertrude Dallas, J.H. Gilmour, Arthur Bauer, and Claude Cooper.'" "Hard upon the heels of The Vicar of Wakefield and Edwin Thanhouser's prediction of further seven-reel special productions comes the news from New Rochelle of the completion this week of a seven-reel 'special' that has been in work three months. The working title is The Heiress, but it is said to carry no indication of the true import of the subject. It has been produced by Ernest C. Warde, director of The Vicar of Wakefield, but the theme is thoroughly and startlingly modern. The cast contains Florence LaBadie, J.H. Gilmour, Gertrude Dallas, Wayne Arey, Richard R. Neill, Arthur Bauer, and Claude Cooper." "Because of her father's last request, Laura Fairlie was duty bound to marry Sir Lord Percival. She was in love with Walter Hartridge, a young artist, who had been engaged as her drawing master. Marian informed Walter that Laura was engaged. He resigned his position and went back to the city. On his way back, Walter met a mysterious woman in white. She informed him 'that Glyde was about to ruin his life, and that he was not all that he seemed.' Fearing for Laura, Walter wrote to warn her. Laura never received the letter, because it was intercepted by a servant of Glyde's. And the nobleman suppressed the message. Fearing that Walter knew something of his past, Glyde secretly secured a position with an exploring party that was going to Central America, and sent one of his men along, slyly hinting that news of Walter's death would be followed by a handsome reward. Shortly afterwards they were married. After a short trip they returned home. Accompanying them was one Count Fosco, a friend of Glyde, whose mission was to assist him to gain control of Laura's fortune. Marian, Laura's half sister, was to live with her, as they were devoted to one another. "Ann Catherick, the woman in white Walter had met, finally managed to meet Lady Glyde, and was in the midst of an accusation against Glyde when the unexpected arrival of the nobleman caused her to flee. As the unhappy wife returned she found to her horror that Fosco had been spying upon her. Marian, having heard Laura's story, determined to keep a close watch on the man. Stealing out on the porch above them, Marian heard Fosco mention that Anne Catherick greatly resembled Lady Glyde. A sudden storm arose, and before Marian could return to her room, Glyde had entered Laura's room, and she was unable to move. Due to exposure, Marian became seriously ill and was confined to her bed. This was their chance. Laura was told by Glyde that Marian was away for a few days. Learning that the mysterious woman had just died, and knowing that she had escaped from an insane asylum, Glyde determined to bring her body to his home and bring Lady Glyde back as the insane fugitive. Due to the great resemblance their plan worked successfully. Marian recuperated and learned the terrible news. It seemed impossible. She determined to investigate. Will Laura suffer for the Woman in White?" "As an adaption of Wilkie Collins' famous novel, The Woman in White offers a somewhat melodramatic but withal intensely gripping story from beginning to end. There is no doubt that the story offers printed advantage over the maintaining of suspense, due particularly to the fact that the villainies are dyed-in-the-wool old time melodramatic in which everything seems to happen expressly for the villain's benefit and not until the very last is the hero given an opportunity to make his gallant rescue. The director has never lost sight of this fact and has kept constantly before the eyes of the audience the subtle villainies which occupy the interest and ably hold the attention until the last. There is plenty of body to the plot and an abundance of dramatic action which is greatly enhanced by the carefully prepared scenario that affords an even running story throughout. "The acting of Florence LaBadie, of course, stands out strongest in the dual role of Laura and the insane woman in white. Both women are opposite in nature, which demands much of Miss LaBadie's versatility. Richard R. Neill pictured well the old fashioned smiling villain, while Arthur Bauer and Wayne Arey added pleasing characterizations to an already satisfying cast. The Woman in White shows care in production. This is particularly noticeable during the time that Ann and Laura are seen at the same time. Instead of resorting to any confusing double exposures, the effect has been gained by the use of quick flashes that enable the audience to follow the story clearly and at the same time eliminate any undue mental energy on the part of the picture patron in trying to figure out who's who. It is a gripping drama throughout, capably directed and ably acted, and reaches a high-water mark in Thanhouser productions. "Balance of the program: This picture is a dramatic offering, pure and simple. The balance of the program will need something very strong for comedy relief. A one- or two-reel slapstick comedy would be the most appropriate. "Musical suggestion: This picture should demand two themes. When the character of Ann Catherick predominates the scene, use music denoting agitation, and during the scenes in which Laura Fairlie is the strongest factor, use a ballad of andante movement. This can be closely followed, with the exception of a number of places that call for a strong dramatic tension and the church fire during the climax of the picture." "The novel from which this film story was constructed offered a unique screen plot with opportunity for lots of suspense to hold the interest from the beginning. The author of this adaptation has taken every advantage of those opportunities and developed a scenario that has resulted in a very entertaining piece of screen fiction, despite the fact that the first scenes, a sort of prologue, are somewhat vague in their connection with later scenes. This is due to the superfluity of plot, rather than a lack of it, and the effort to make the element of suspense predominate from the first scene. "The story affords a good dual role for Florence LaBadie, and she gives a particularly good portrayal of the title part, the weak-minded girl who escapes from the asylum to which she was committed five years before by Sir Percival Glyde on account of her knowledge of a fraudulent entry he made on the church books on which to base his claim to the title. The 'woman in white' then eludes capture and warns Laura Fairlie, an heiress whom she strangely resembles, against the marriage to Sir Percival, arranged by her father. After the marriage she continues to warn Laura and her sister Marian. Finally Glyde and his accomplice, Fosco, find Ann in a caretaker's hut, realize that the girl cannot live long, and to obtain Laura's fortune, plot to put Ann in her place. Marian overhears the plot, but illness from exposure renders her unconscious. The plot succeeds and Laura is put in the asylum and Ann is buried as Lady Glyde. On her recovery Marian, with the aid of Walter Hartridge, whom Laura had loved, unravel the plot and force Fosco to confess. Glyde goes to the church to tear out the evidence of his fraud, overturns the lamp and is fatally burned. Before his death he confesses, leaving Laura free to marry Walter. Richard Neill and Arthur Bower [sic] do good work as impostors. Mr. Neill is a very finished villain and his contemptibility in his screen work is the best evidence of his ability. Others in the supporting cast are capable, while technical details and direction make the film a very satisfactory feature." REVIEW by Edward Weitzel, The Moving Picture World, July 7, 1917: This review is reprinted in the narrative section of the present work. "Points of Interest: Adapted from Wilkie Collins' well-known novel, it is an absorbing melodrama, capably acted, and with a well written scenario. "In adapting The Woman in White from its popular original Lloyd Lonergan extracted that material from the book which was certain to be the most interesting on the screen. There was a fund of matter that could have been used, but Mr. Lonergan retained only the most essential points, kept the story from being too old fashioned, and supplied excellent continuity. Furthermore, this material is presented to the spectator with ability, clearness and judgment by the cast. Florence LaBadie plays a double role in half of which, however, she has very little to do and plays it well. Richard R. Neill is sufficiently sinister and suave as the villain. The rest do not fall behind the standard set by these two. "The story concerns the efforts of a bogus count to obtain the fortune of his wife, even to the extent of having her placed in an asylum for the insane. He does this by substituting for her a weak minded girl - the woman in white - who is a prototype of his wife, and who had escaped from the institution some time before and who later dies. The pseudo count is shown up through the medium of several warnings given by the woman in white before her death which are heeded by the wife's sister and a young artist who is in love with the unfortunate wife. These two are united when the girl becomes a widow through the villain being cremated by accident. The direction of the picture is carefully handled and Ernest C. Warde is to be complimented for his work. He has chosen atmospheric settings and has caused the action to travel at an even and correct speed. Exhibitors who cater to the average class of audience need have no doubt of The Woman in White entertaining patrons. Generally a melodrama embracing social intrigue proves popular. By all means display Florence LaBadie's name in the advertising. - F.T." "As a novel this is rather well known - or at least the name is - and because of that the production will have a certain amount of weight, even though the story as screened fails to convince or impress as real at any time. The average audience will consider this quite worthwhile and better than the average program release for the one reason that the producer has used many trick lightings, which give an atmosphere of distinction to what would otherwise have been an ordinary mystery melo of the old well-known 'remarkable resemblance' type. "The plot centers around the attempt of the willun to gain control of his wife's estate through placing her in an asylum under the name of the woman she resembled, who had been buried as the wife. Film fans have seen so many of these 'remarkable resemblance' stories that they aren't very strong for them any more. Such a central thought in a story makes it almost impossible for the average fan to consider the incidents as real life. "Miss LaBadie was quite satisfactory in the two parts, but neither the star nor any of the cast registered personalities sufficiently magnetic to lift the scenes out of the ordinary mystery melo rut. Many times the titles jarred very badly, because they didn't jibe with the action. There was entirely too much reference made to the influence of 'Fate' upon the lives of the characters. In the cast were Richard R. Neill, Gertrude Dallas, Arthur Bower [sic], and Wayne Arey. "The Box Office Angle: If you have been playing program releases this should get by satisfactorily, because the lightings give it a touch of distinction not found in the ordinary program offerings. The mystery of the situations arouses a certain amount of interest, and, while the production is a long way from being an exceptional film, it is one that will probably be classed as good, or at least acceptable, by the average patron."